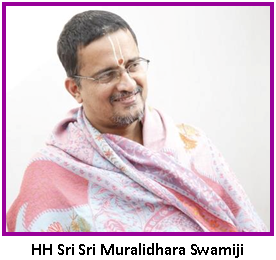 Categories: Guru, Sri Sri Muralidhara Swamiji. 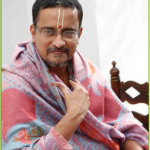 Vasudeva Kutumbakam (The entire world is Lord Vasudeva’s family) is true for our satsang members. Our satsangs are in various countries like America, Muscat, Australia, Dubai, Indonesia, Abu Dhabi, Singapore, Malaysia, UK, New Zeeland, Fiji Islands, Papua New Guinea, etc. Parents of our overseas satsang members who visit them for a few months, come back and share with us their satsang experience with much joy and enthusiasm. Some of the exciting comments are like, “Right from a 2-year-old child everybody talks about Sri Swamiji so affectionately”, “Everybody is so bound to a single mantra ‘GURUJI’”, “Nama Varsha and Utsavs are so frequent and well done over there”, etc. Some who move back to India even tell Sri Swamiji that they do not get as much satsang in India as they get abroad. When Balaji Narasimhan’s children (from Atlanta, USA) chanted Kunti Stuti, Bhishma Stuti even in jetlag and while half asleep, Sri Swamiji was so excited and happy about it. Namadwaars are being established across various parts of the globe. Our Sydney, Australia Namadwaar is nearing completion. Bhoomi puja was performed for Houston (USA) Namadwaar on November 8, 2014 in presence Ramanujamji. Srinand and Krithika are a couple who are part of our satsang in Houston. Krithika’s mother Shyamala couldn’t get Sri Swamiji’s darshan during her first visit in 2008. She got Sri Swamiji’s photo and started chanting Mahamantra in front of the photo right from that day. She participated in all the satsangs when she visited the US and got Sri Swamiji’s darshan on her return. She even stayed at the ashram for one whole week to participate in a Bhaghavata Saptaham and get Sri Swamiji’s dharshan. Srinand and Krithika prayed to Sri Swamiji for santana bhagyam (child). Sri Swamiji prayed for a few minutes and gave them prasad saying “You will get, not a baby, but babies!” And yes, they were later blessed with twins. Sri Swamiji named them as Raman and Lakshmanan. Krithika’s mother Shyamala calls Sri Swamiji as “Gurujipa” only. She suffered from cancer and even when she was going through the pain, she would always chant Mahamantra and think of Sri Swamiji. Come what may, however the pain may be, she used to visit Sri Swamiji during every Ekadasi and used to say that the way Sri Swamiji always enquired after her health was the best palliative care. Krithika would ask her mother, “Anyway, you will leave this world. After you, who will give me the right advice?” The standard and firm reply always was “What if I depart? You have got a wonderful Guru to care for you and your family all the time. What else do you want? So you should never worry!” Such was her faith.